Tell people their gas taxes are going up and they will riot, literally. 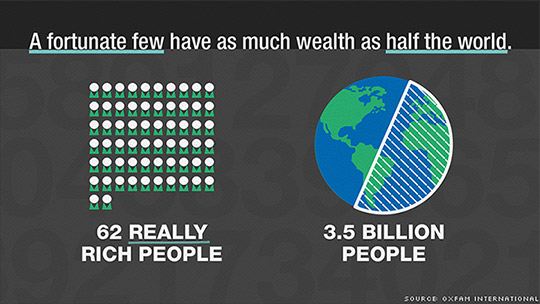 Tell people that 62 individuals hold the same amount of wealth as the 3.7 billion people who make up the poorest half of the world’s population and we don’t blink an eye. Okay, maybe we do a hard blink but we certainly don’t riot. Or perhaps gas tax riots are actually severe wealth inequality riots in disguise? France has been embroiled in mass and violent protests to proposed diesel and gas tax increases that have forced France’s government to suspend its plans to increase taxes and to also immediately freeze prices on electricity and home heating fuel. The proposed taxes, meant to curb climate change by weaning motorists off petroleum products and to generate funding for renewable energy projects, were received negatively by several sectors of the French population. Their message carried out by the “gilets jaunes” (yellow vest) movement resulted in violent protests in Paris and caused four deaths. A number of U.S. publications chimed in on the French protests claiming they show a Global Carbon Tax Revolt, claiming that people from Washington to Ontario to France are saying no to taxing carbon. But what they conveniently portray as a revolt on carbon taxes (which happens to match their ideological opposition to climate action) I see as a sign of frustration and impotence over massive wealth inequality. Wealth inequality has widened all over the world, leaving many people struggling who previously enjoyed more secure prosperity. In the U.S. and France the cost of living continues to increase while wages and earnings stagnate for most. At the same time the top earners seem to accumulate all the wealth: in 2017 Oxfam reported that the top one percent secured 82 percent of all wealth while the bottom 3.7 billion who make up the poorest of the world saw no increase in their wealth. Favorable tax policies for the rich in the U.S. and France’s recently approved budget show signs of exacerbating wealth inequality in those countries, leaving people with scarce resources contributing greater amounts of their income to basic necessities like housing, food, health care, education, and transportation. And when government needs to step in to rescue someone from economic collapse, it seems to only bail out corporations like banks, automakers, and utilities. Regular citizens do not seem to enjoy the same level of concern from decision makers about our economic well being. But why do people riot over gas taxes and not massive wealth inequality? Because we feel the economic pain from a gas tax increase more intensely and immediately than structural systems that help a very small set of people to accumulate wealth. All people can understand a gas tax increase. Very few people can explain the income ramifications from the 2017 tax reform approved in the U.S., the largest tax reform of last 31 years. In my opinion, the French gas tax riots stem from the same place as growing resentment towards immigrants globally, increased scrutiny over social welfare and entitlements, and growing right wing populist movements: scarcity. People wouldn’t riot over a gas tax if they could afford it. Instead, people in France are rioting and some media outlets in the U.S. blame it on the French elite supposedly pushing their climate agenda on the people. They are wrong. My proof is California. In the world’s fifth largest economy, residents of California have made it abundantly clear that we want our state government to act on climate. We’ve been pricing carbon since 2013, collecting over $8 billion from polluters to invest in our state to fight climate change. In our most recent election we also soundly defeated an effort to repeal a gas tax approved by the California legislature in 2017, which has invested almost $10 billion to improve the state transportation infrastructure. And there is no sign of our residents slowing down our ambition and urgency to combat climate change, having recently approved an effort to generate 100% renewable energy by 2045. And while all these actions are good news for climate policy and California, there are warning signs from France’s gas tax riots. California has not been able to address our own income inequality challenges, and while our residents continue to support ambitious government action to fight climate change we have to be very intentional about implementing strategies that fight poverty and pollution at the same time. In fact, we are not pricing carbon nearly high enough to ramp down our use of fossil fuels; so if we want California residents to continue to support our fight against climate change we must address income inequality. We must do this not so people can afford to pay higher taxes on fossil fuels but so that people can afford to live, work, play, learn, and prosper in a world that is healthy, resilient, equitable and thriving. Meaning a world free of fossil fuels. Alvaro Sanchez is Greenlining’s Environmental Equity Director. Follow him on Twitter.